With years of experience in providing accurate and thorough mapping with associated services, Declan Noonan & Associates have built a strong reputation for the provision of services for property definition and transfer for commercial & residential developments. We use the most up-to-date mapping technology and mapping software. Do you use a right of way to access your land? Are you aware that under the new Land and Conveyancing Act 2009 that all rights of way have to be registered with the Land Registry or Registry of Deeds? If you have a right of way over another individual’s land, whether by deed or by long use, it is important now to take steps to insure protection of that right. Under the new Land and Conveyancing Act, which came into effect in December 2009, the rules in respect of rights of way have changed. This act was enacted by the last government to modernise Irish Land Law and gave a three-year grace period in a bid to give people the opportunity to take the necessary steps. This three-year grace period was then extended which means that applicants for registration have until 30th November 2021 to register (instead of 30thNovember 2012 as had been the case prior to the 2011 amending legislation). Contact Declan Noonan & Associates to register your right of way. For more information on the rights of way legislation click here. We will accurately establish and define your boundary/ Right of Way on the ground as identified by title deed maps, thereby facilitating clients by objectively interpreting both title deed maps and physically defining the boundaries on site. 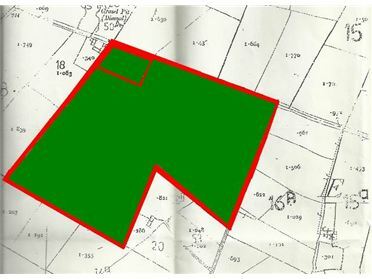 If you are considering subdividing your land into sites we can accurately map your land subdivision for registration purposes. We can also advise on the best position for these sites with regard to planning permission. Mapping for the transfer of common areas to management companies as required by the Multi-User Developments (MUD) Act. Objective review of all deeds, documents, maps etc. relating to a disputed boundary, right of way or whatever and preparation of an expert report. Assistance in resolving boundary issues either through conciliation / arbitration or the courts. Assistance in the processes required to resolve the dispute from conciliation to arbitration to the courts. Review of mapping used to create a folio with respect to the current Folio Map of said folio. Liaison with the Property Registration Authority with a view to having the folio mapping, albeit non-conclusive, corrected. Provision of independent measurement and production of floor plans of actual net lettable area of commercial units which are referred to and annexed to legal lease agreements. Accurate measurement and certification of lands for sale in rural and urban regions on behalf of the vendor or purchaser. Certified signing of Declaration of Identity and other legal documents in relation to property matters. Objective overlaying of historic deed maps etc. onto current Digital Ordnance Survey mapping for comparison. Updating old title deed maps of properties to digital format acceptable to the Land Registry. Department of Agriculture acceptable maps for Single Farm Payments and the Disadvantaged Area Scheme. Maps for sub-letting or share-farming agreements. We can act as an expert witness for you in the case of a boundary dispute. We can prepare professional reports suitable for use in litigation situations. We are available to attend, and to act as a professional witness at Courts of Law. Sometimes, a Solicitor when advising their Client will require a report prepared by an Engineer or Surveyor. This report will need to be accurate, concise and independent in order to enable the Solicitor or the Counsel to best prepare their Clients case. We aim to provide an unbiased, professional opinion in our reports. These reports are prepared in a clear and concise manner, and are supported normally with appropriate drawings and photographs. Click here for more information on Expert Witnesses. We are qualified and experienced in appropriating the value of property for stamp duty purposes. We are a one stop shop providing both mapping services and valuations in the one place saving you time, money and hassle. Contact Declan Noonan & Associates for more details.